Unsuccessful attempt from the centre spot. 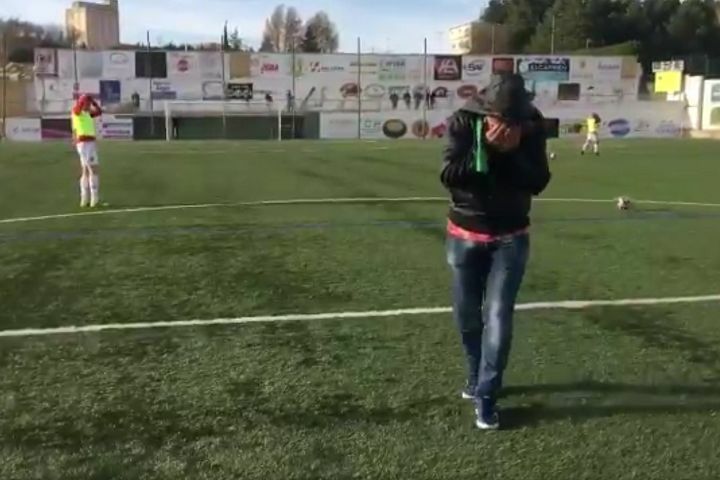 A fan hit one of the substitutes warming up on the pitch during a shooting competition at half-time of Guijuelo’s Spanish Segunda División B clash with Sanse on Sunday. A select group of supporters were invited down onto the grass to take shots at an open goal from the halfway line as part of the entertainment at the break. A gym pass was said to be on offer to the winner of the contest, although it is also being reported that no one won. ¡¡¡ Una semana más que os vais de vacio del Municipal !!! Entrenar estos días y en dos semanas , @Toyota_Esp os dará una nueva oportunidad . One bloke managed to whack a nearby sub with the ball from close range with his effort. A clip of the attempt was quickly published on social media by the club, who suggested he should be rewarded after his fellow competitors were also unsuccessful.